With the US Fed’s third quantitative easing program since 2009 announced in latter 2012, QE3, we know the Fed is explicitly targeting two key hoped for outcomes. First, Mr. Bernanke has told us he wants to see higher stock prices. So far, so good. The thinking being that if stock prices rise, households will “feel” wealthier and be motivated to increase their consumption – the so-called “wealth effect”. Secondly, Mr. Bernanke tells us that the Fed intends to keep interest rates at zero and will continue to print money (at a current annual rate equal to 6.5% of GDP, well above actual GDP growth) until the US unemployment rate at least reaches 6.5%. But are these two key Federal Reserve endpoint goals actually at odds with each other? I do not see this question being asked, but believe it is very deserving of consideration. Could it really be that the Fed’s own worst enemy in this grand and unprecedented monetary experiment is…the Fed itself? And if indeed the Fed may in part be working against itself, what does that mean for the markets and economy? Let’s start with some backdrop. In the past I have written about my own perception that in the current environment the “wealth effect” is an academic fallacy. At the heart of the Fed’s wealth effect assumption is that households will have something to spend. Wage growth in the current economic cycle has been tepid, to be charitable, so growth in wages will not be meaningful fuel for additional consumption at the margin. If stock and real estate prices rise, as the Fed wishes, again, what will households spend? Will they sell their stocks and real estate, and use the proceeds for short term consumption? From the early 1980’s to the middle part of the last decade, the US savings rate dropped from a high of 12% to a low of 1%. Over that period where stock and real estate prices ascended in generational fashion, households spent down their savings – that was the wealth effect in action. Bottom line being, the precursor of a positive wealth effect is a substantial household savings rate. In the current cycle, households have not been able to rebuild their savings due primarily to ongoing deleveraging and lack of wage growth. The character and magnitude of household savings are key not only to the Fed’s desired wealth effect (a primary rationale for QE), but also play an important secondary role in the broad economy that ultimately impacts payroll employment (the latest Fed target rationale for QE3). If you’ll bear with me for a minute, let’s review the academic definition of GDP. Although perhaps painful, you may remember that in your Econ 101 class of yesteryear, GDP, or output, was defined as the sum of consumption, Government spending and investment (simplistically this definition ignores imports and exports). Whatever is not consumed by households or the Government is available as savings, or investment. It’s in this basic equation that we see the importance of savings as the fuel for future investment in productive economic assets. Now to the potential conundrum in Fed policy of the moment. One fingerprint character point of the current economic cycle has been the unprecedented weakness in business fixed investment. Very important in that investment in productive capacity (think manufacturing plant and equipment) provides any economy a basis for future growth in trade, and by definition jobs. What could be more important in the increasingly globalized and competitive economy of the present? It’s not wildly surprising in that businesses invest when they foresee expansion in aggregate demand. We know this has been a very slow growth environment. The top portion of the chart below shows us the history of US business fixed investment as a percentage of GDP. Experience in the current cycle reveals the lowest non-recessionary level on record. And in the current economic cycle, this has been accompanied by some of the lowest historical US savings rate levels ever seen. As your economics teacher would remind you, savings equals investment. One more important historical economic data point correlation that ties the importance of business fixed investment to payroll growth. The chart below shows us the year over year change in US business fixed investment alongside the annual change in US payrolls. The key observation is that historically, the year over year change in fixed investment has led the year over year change in US payroll growth in each economic cycle of the last half century. As stated above, fixed investment is the cornerstone of longer term growth in productive capacity and jobs. So back to the original question – is current Fed policy focused on both the wealth effect (the stock market) and lower unemployment competing agendas? IF the Fed is successful in sparking a wealth effect via higher stock prices, already low US savings will be further drawn down for consumption. But as per the very academic definition of GDP, increased savings are crucial for the expansion of business fixed investment. Importantly, we know from the historical chart above that increased US business fixed investment is directly tied to US payroll expansion. Increased savings equals increased investment, which in turn increases job growth. So for the Fed to see a lower unemployment rate, it makes sense that US savings (and investment) need to rise. But if US savings rise, it will be at the expense of present consumption, negating the supposed positive wealth effect of driving stock prices higher. At least to me, it’s a very confusing Federal Reserve agenda. I have heard Mr. Bernanke give many a speech espousing the benefits of money printing in terms of levitating stock and real estate prices. But I’m still waiting for a speech that has never been given. A speech that directly links the Fed’s money printing and purchasing of US Treasuries and mortgage backed securities to actual job creation. I would think for an academician such as Mr. Bernanke and many of his Federal Reserve cohorts, there must at least be an equation similar to the exercise I walked through above regarding such a linkage between Fed bond buying and jobs, shouldn’t there? I guess for now it’s a secret. Current business fixed investment remains subdued in terms of growth. That tells us payroll growth will come, but it will be slow. Not surprising within the context of a still relatively slow growth economy compared to historical experience. Near term, Fed money printing will continue to support asset price reflation. In the absence of accelerating fixed investment, corporate cash flows are being used for dividend increases and stock buybacks, likewise acting to underpin stock prices. Given this set of circumstances, we do have an environment where financial assets prices may diverge from underlying macroeconomic fundamentals. It’s into such divergence potential where risk management in the investment process takes on heightened importance. Will QE Affect The Effect? When global central banks began to expand their balance sheets in an attempt to ward off the Great Recession of 2008-2009, their efforts were unprecedented. Never before had we seen so much money creation occur simultaneously on a global basis. At the time, planned central bank quantitative easings (printing money) were well defined in terms of time over which they would occur and magnitude of dollars/foreign currency involved in each QE iteration. That was then. Despite significant global government borrowing (US Federal debt alone has doubled since 2006) and global central banks printing over $11 trillion since 2008, global economic growth is tepid. In fact, this unprecedented global government borrowing over the last four years has necessitated tax increases in many countries, including the US. The US has sold this as a tax on the wealthy. But when looking at the reality of US Government budget and forward spending projections, there is absolutely no way our federal government can fund its current spending and promises trajectory without very meaningful middle class tax increases to come. Shhh!!! The politicians just have not told anyone yet. As a bit of a bookend to global central bank balance sheet expansions, we’ve now come 180 degrees from where we were in early 2009. No longer are central bank quantitative easings defined either in terms of time or magnitude – several central banks have recently promised unlimited money printing over an indefinite period of time. This is exactly what the US Federal Reserve continues to say and do four years into our current economic recovery. The election of Abe in Japan a month ago cements the fact that the Bank of Japan will join in unlimited money printing. The Bank of England is on the cusp of another round of money stimulus. And despite the recent appearance of calm in Europe, banking system recapitalization has not even begun – it will be quite the eye opener in terms of European Central Bank balance sheet expansion to come. Four years after the Great Recession reportedly ended, global central bank actions are pushing the definitional limit of “unprecedented”. So what has been accomplished by central banks in their historically unprecedented monetary experiment, if not achieving acceleration in economic growth? Well, the nominal level of interest rates rests at generational lows. By pushing interest rates to rock bottom, central banks have raised the net present value of alternative streams of cash flow. In other words, they have been successful at inflating certain asset prices that might not otherwise have risen to their current heights. The US Fed has told us without flinching that they have been directly targeting stock and residential real estate prices. Why? The Federal Reserve believes in what has been termed the “wealth effect”. The thinking goes like this. If asset prices rise, consumers will feel more “wealthy” and will consume at a higher level than would otherwise have been the case. Additionally, consumers might even feel well off enough to borrow and spend if the value of their houses and portfolios rise, exactly as happened during the housing boom of the prior decade. The fact that consumption drives roughly two-thirds of US GDP has certainly not been lost in Fed thinking and actions. Now that we have embarked on perhaps the final phase of unlimited and indefinite global central bank money printing, will this quantitative easing finally, positively affect the “wealth effect”? Will boundless and limitless promises of money printing do the trick in getting US and global consumers to finally borrow and spend? So far, rising home prices for the last year and rising stock prices for the last four have yet to be the tonic for accelerating domestic consumption. Over the 2007 to early 2009 period, consumer net worth in the US contracted close to $12 trillion. If stock and home prices continue on their current price trajectory, all of this contraction in household net worth will have been recovered sometime this year. Households should be feeling great, correct? So, will it work? Well, that remains to be seen. Moreover, we question the ability of central bankers to positively affect the so-called household wealth effect (and by implication consumption) by simply printing unlimited amounts of money to levitate residential real estate and equity prices. Why is this the case? Let’s have a look back at some data history I believe is quite important in contemplating this question. For not only does it have bearing on forward potential economic strength, but speaks to where stock and residential real estate prices may head for a time. 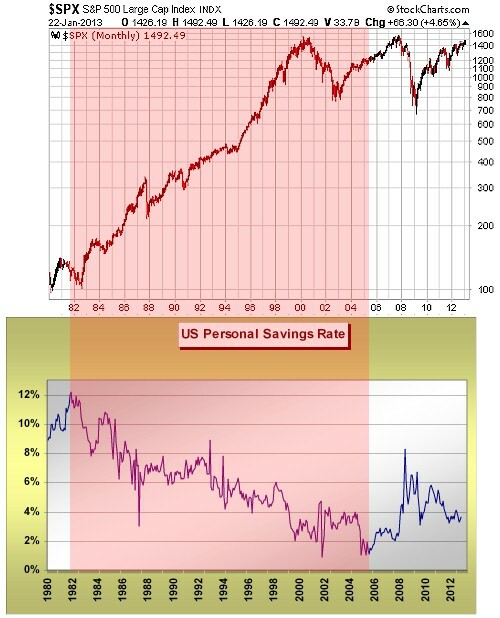 The graphs below display the US savings rate and the S&P 500 since 1980. The large rise in stock prices from 1980 to present is clear. Intuitively, we also know that over this same period residential real estate prices increased significantly, despite the downturn of the last half decade. Neither of these phenomena should be surprising, as the 1980 to present time frame mimics the coming of age and maturation of the baby boom generation – a generation that bought homes and started retirement plan savings en masse over this period. What this historical relationship implies is that for the “wealth effect” to be a positive economic force that spurs consumption, households must have something other than stocks or real estate assets to liquidate and use for consumption, exactly as they did from 1980-2006. They either need to spend their savings or borrow to consume. 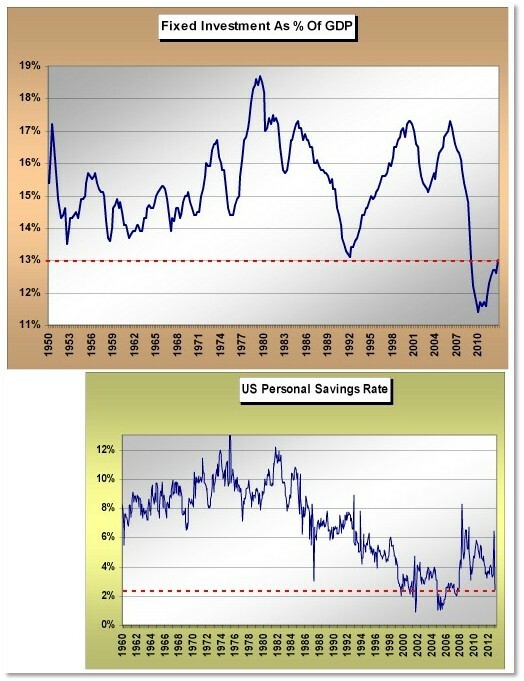 The key issue of the moment is that at least in the US, savings have not been rebuilt post the Great Recession. As of now, there are no increased savings to spend down while the Fed attempts to make households feel better via their efforts to levitate residential real estate and equity prices. The household savings rate today stands just shy of where it stood in January 2008. I’d again ask the question “spend what?” In the post Great Recession environment, the largest growth in consumer credit has been in student loans, not in revolving or non-revolving credit balances. Households hurt by heavy debt balances, largely related to real estate investments from the prior cycle, have not embarked on a new borrowing cycle. From my vantage point, QE will not positively affect the “wealth effect” and translate into accelerating consumption and domestic GDP growth directly because of the lack of domestic savings, and households remaining gun shy about leverage. So where does this leave us? It still leaves us with global central bankers committed to unlimited and indefinite money printing, but also a persistent ongoing disconnect between the printing of money and actually getting that money into the real economies globally, as has been the case since 2009. The money they “create” still needs to find a home. And now that we’ve moved into unlimited money printing mode, that means one big home. As a rule, central bankers can create additional liquidity, but they cannot control where or how that money will be put to use. Ideally, they would like to see banks increase lending with this unprecedented liquidity and theoretically get that money into the real economy, but bank lending has been very slow. Almost as default, that leaves the global financial and commodity markets as a potential repository for historic global central banker largesse. Over the past four years we have heard more than a number of commentators tell us that “the stock market is doing well so the economy must be doing well”. Unfortunately this has not proven to be the case as we continue with one of the most anemic economic recoveries on record. Although we are certainly not there yet, the danger is that this current round of extraordinary excess central banker liquidity creates further asset bubbles, very much as happened with the late 1990’s tech stock bubble and the clear bubble in mortgage lending in the middle of the last decade. By the Fed’s own admission, they missed “seeing” the last two asset bubbles they had a hand in creating. Now that we have moved into the endgame of global central bank monetary expansion, let’s hope central bankers everywhere have had their annual optometrist check-up.